Whether you are an adult or a little kid, going to the fair is always a fun experience! When you stay at Lake Pointe Inn, you will be able to enjoy both the calm and peaceful ambiance of the Deep Creek Lake and the exciting atmosphere of the Fair with the locals. Read on to find out about the Garrett County Agricultural Fair! The first Garrett County Fair was held in 1917 in the Naylor Building on Third Street in Oakland. Several years later, as the fair became more and more popular, sheds were constructed near Center Street on the Sweeney lot to house some of the exhibits. The successful fair was held at this location until the early twenties. Because more space was necessary, the Bradley property west of Oakland was purchased to accommodate the hundreds of people that came to the fair. Today, the Garrett County Fair stands as one of the true remaining agriculturally based fairs in the state. From horse shows to the crowning of “Miss Garrett County Farm Queen & her Court”, you are sure not to run out of things to do at the 56th annual Garrett County Agriculture Fair! Start your evening off right by seeing one of the many events the fair has to offer. Head on over to the horse barn and watch some of the most beautiful steeds frolic around the ring at the Horsemanship Contest. If you enjoy the art of dancing, watch the Still Kickin’ Cloggers show off their dancing skills. Visitors can watch livestock shows of horses, goats, sheep, beef, dairy, swine and more! Choose your favorite and enjoy the show! Afterwards make your way over to the Ag Heritage House to see some scrumptious food. Almost every evening at 6 p.m. there is a cooking demonstration at the Hall. Sit and watch as chefs present some of the most delicious smelling food, but make sure to grab a bite to eat before going, because you don’t want to be hungry! 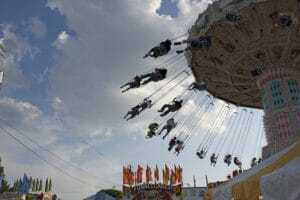 The Garrett County Agricultural Fair has a wide variety of fun, family activities and contests. Enjoy shows featuring Jimmy B, Lindsey Erin, The Fabulous Hubcaps, Davisson Brothers and more! Click here to view the event schedule. The fair also has several rides for guest to enjoy. Take a peaceful ride on the Ferris wheel to take in a picturesque view of the countryside or fall at incredible speeds on the drop tower! Whether you are there to see the animals or ride all the attractions, the Garrett County Fair is fun for everyone! While you’re making your plans to attend the 56th annual Garrett County Agriculture Fair, don’t forget to book your stay at Lake Pointe Inn. Our McHenry bed and breakfast is the ideal place to relax and rejuvenate in between taking in all the shows and attractions. Our rooms and suites have cozy amenities and comfy furnishings, ideal for unwinding after a memorable evening at the Garrett County Agricultural Fair. And while you’re with us, you can take advantage of our massage treatments that are exclusively for inn guests. Your stay includes a tasty breakfast each morning. Come to Lake Pointe Inn and have the ultimate Deep Creek Lake experience. We can’t wait to see you!